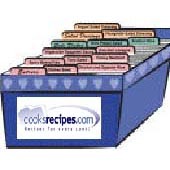 "This recipe was given to me by my friend Della. She makes it for her yearly 'girls night out' Christmas Party. It's delicious with any crackers." - Submitted by Shelley of Massachusetts. Have cheeses at room temperature and mix together well. Mix the garlic powder. Chill slightly, then divide and form into two balls. Roll in walnuts if desired. Refrigerate until ready to serve.